Milan Kundera’s book is both bewitching and moving. Richly textured, it is the embodiment of all that is mysterious, beautiful and horrifying about the modern world. The story itself follows the happenings of a Czech couple, Tomas and Tereza. Tomas is a serial and mostly unrepentant philanderer who Teresa is madly in love with, and she endures incredible pain at the hands of his infidelities. The Russian occupation of Czechoslovakia reduces Tomas from a respected surgeon in Prague to a window cleaner, then truck driver. His fall from grace does nothing to hamper his philandering. The novel charts their adventures. The narrative is intertwined with piercing philosophical interjections – hence, the unbearable lightness of being. Parmenides is the philosopher of choice for Kundera, who floated the idea that at the heart of the universe is a fundamental binary principle, which determines the manifestation of everything else, and was an early proponent of dualism. The novel is complex and apparently postmodernist. Kundera himself often breaks the spell and enters the narrative as an authorial voice, much like in the Victorian novels of yesteryear. This only serves to emphasise how absorbing the novel is. It’s like lifting your head above water and staring round for a few seconds, before submerging, beneath the water, once again. This novel is a triumph, for reasons I can hardly begin to articulate. The language and drama are taut and captivating, whilst the juxtaposition between high philosophical musings and the visceral realism of bodily excretions and furtive sexual fumblings is masterfully written. The backdrop of totalitarian, Communist Russia pervades the entire novel like a slumbering beast, but never quite takes centre stage. At first this seems like it could be an ambitious political critique like Orwell’s 1984, before it slowly becomes clear that the focal point is character. The emotional struggles of Tomas and Teresa writhe across the page until the dramatic, comedic and tragic ending. Hardly ever have I enjoyed a novel this much. The Harry Potter series, of course, was number one choice in my younger days; when my mind wasn’t quite mature enough to enjoy much “serious” literature. Next, Stephen King and his pacy modern horror novels, then Terry Pratchett’s kaleidoscopic Discworld and the laconic Rincewind. After that, trashy teen fiction. Once at university, with pretensions to serious intellectualism and a new taste for the feminist canon, I worshipped Virginia Woolf’s outpourings and also the magnificent T.S. Eliot. There have been others along the way but these are the diamonds. Finally, Milan Kundera, who I assumed was a woman until I typed his name into Wikipedia halfway through the novel, has taken literature a step in a new direction for me. I read The Unbearable Lightness of Being over several tube journeys with fascination, pathos and amusement. Kundera says that character is not in fact the representation of the author, but the manifestation of his own stunted possibilities. I was rapt. 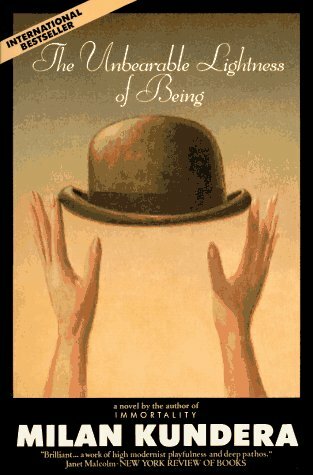 The unbearable lightness of being – as well as being one of the most inspired titles I have ever come across – is the futility of existence, which through being liveable only once can never have any weight. The wars and tragedies of history, acted out only once, dissolve meaninglessly into the dusts of time. However, traditional dimorphic representations of opposites are turned on their head in this novel, and Kundera asserts that heaviness, which is achieved through repetition, may actually be a burden. The novel itself ends somewhat hopefully, though you’ll have to read it to find out how. I don’t know if I completely understand this novel, but that probably doesn’t matter. While the subject matter is often ethereal, philosophical or historical, it never feels like you’re ploughing through a weighty tome (pun definitely intended). The stark beauty of Kundera’s prose and the realism of his characters has inspired me to seek out more Eastern European authors, and indeed there are many recommended on Google. I’m actually considering reading War and Peace (1869) by Tolstoy next.